Rob Zombie Discusses His View Of The Upcoming RAISED EYEBROWS Film! Rob Zombie talks about post-production on his latest horror film, 31, and then discusses how the RAISED EYEBROWS movie project came to be and his take on the story. New Interview About RAISED EYEBROWS – The Book & The Movie! I recently had the pleasure of appearing on Chicago’s “Dave & Dave” radio show, along with hosts Dave Weiser and Dave Niven (hence the name). Although they don’t archive their broadcasts once they’ve aired, they were fool…er…kind enough to share the file with me so’s I can share the show with you kindly-type folks. 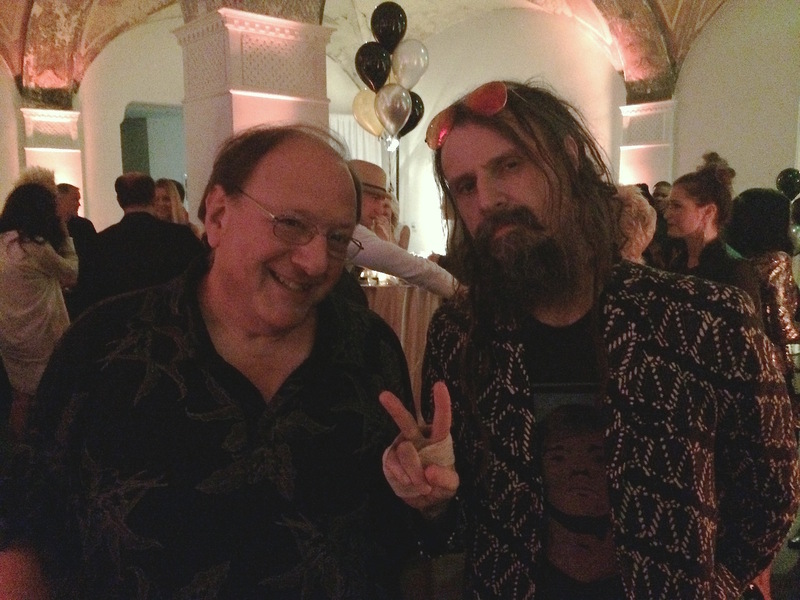 So here I am, yammering on about working for Groucho, writing RAISED EYEBROWS, how Rob Zombie and I got together, and hypothesizing about the upcoming filmic version of said memoir. Back In The “Bruin” Again! Forty-one years after “The Committee for the Rerelease of ‘Animal Crackers'” makes headlines in UCLA’s Daily Bruin, I’m back in the Bruin again! Rob Zombie Interview About “RAISED EYEBROWS: THE MOVIE”!! Here’s an exclusive interview with Mr. Zombie that gets into the importance of “RAISED EYEBROWS: The Movie” in terms of his career – ‘n’ stuff. Interesting reading! Hollywood Reporter Publishes My Piece On The Rob Zombie Film! For those who may be wondering how I crossed paths with the likes of Rob Zombie and ended up handing over the reins to my very personal story, I have penned this essay, which just appeared in the online edition of The Hollywood Reporter. I originally entitled it I Walked (And Talked) With A Zombie, but the editor explained that they had to go with a title whose key words would trigger the randomly generated algorithms or self-hating logarithms or some sort of newfangled whatchamacallits. At any rate, it’s a fuller explanation of how the RAISED EYEBROWS movie project came to be and why this may not be as outrageous an idea as it might seem. New Artistically Animated Promo For RAISED EYEBROWS! Here’s a different kind of animated promo for RAISED EYEBROWS – called “whiteboard animation” – also done by that talented fellow Terry Motley at motleypr.com. I think it’s pretty nifty (but then I would). New Animated GROUCHO Promo For RAISED EYEBROWS! Terry Motley of motleypr.com made this terrific 23-second animated promo about RAISED EYEBROWS – and the news that it’s going to be made into a film! In addition to being able to order the Kindle and Audio versions of my book on Amazon, you can always click on my SHOP page and order a signed or personalized copy of the newly revised and expanded paperback version! Here’s a Skype interview I recently did for “The Junot Files.” In it, I discuss the upcoming film version of RAISED EYEBROWS, how I met and came to work for Groucho, and what that extraordinary experience was like! BIG News! A Film Version of RAISED EYEBROWS Is On Its Way!! Rob Zombie might seem an odd choice to direct a film version of RAISED EYEBROWS, but that happens to be his favorite book of all time (!) and he is positively passionate about doing justice to it. Oren Moverman co-wrote the screenplay for the recently released Brian Wilson biopic, “Love & Mercy,” so he is a terrific choice as co-writer on this one and a very skilled screenwriter. Casting is still to be decided upon, but watch this space for updates. Meanwhile, here’s Rob & me – the Odd Couple! Steve Stoliar & Rob Zombie – The oddest Hollywood couple since Ernest Borgnine proposed to Ethel Merman. On April 14th, 2015, The Hollywood Reporter published a piece I wrote on the affectionate, entertaining, and star-studded memorial I attended honoring the late and much-loved “Laugh-In” announcer, Gary Owens. Read all about it (and him)! Steve Stoliar Returns To Gilbert Gottfried’s Amazing Colossal Podcast! L.A. Times Mentions RAISED EYEBROWS Film & New Interest In The Marx Brothers! RAISED EYEBROWS Audiobook CD Now Available! !